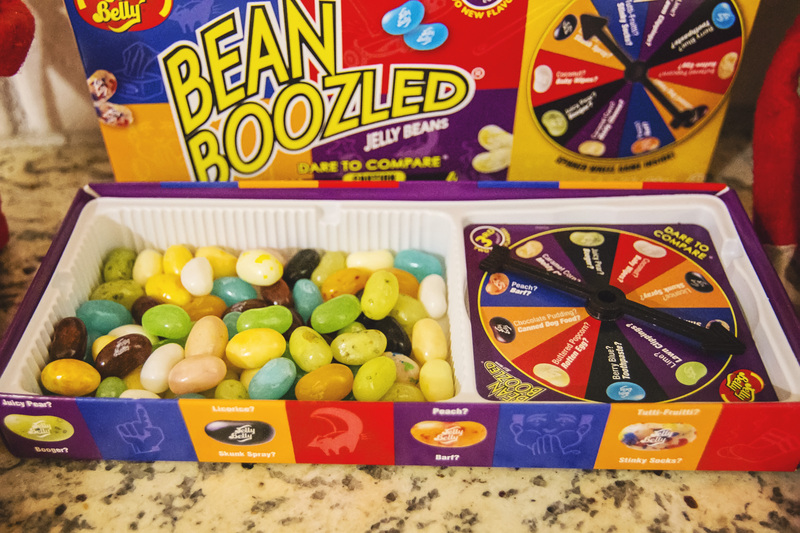 If you’ve never heard of the game Bean Boozled, let me take a moment to fill you in (because this is one game you definitely don’t want to agree to play unless you have full disclosure of what’s about to happen to you). Basically, you’ve got a box full of jellybeans. 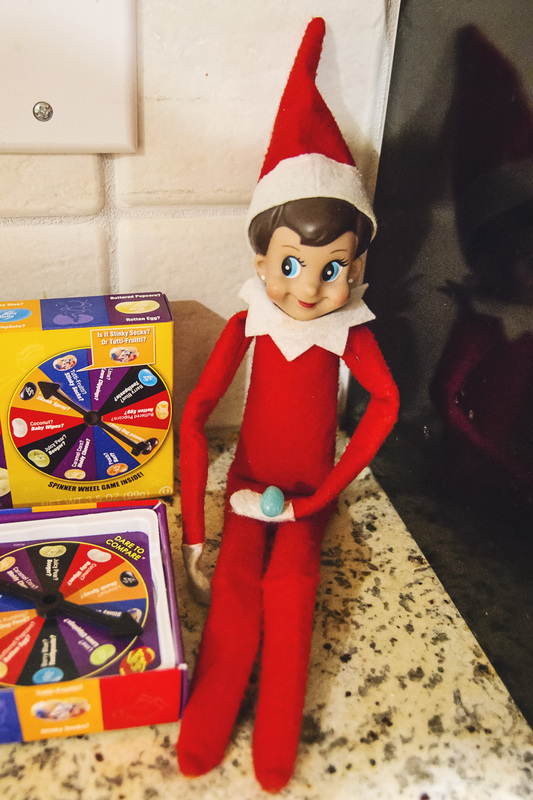 You spin the little wheel, pick the matching jellybean, and eat it. But this is where things start to get messy. 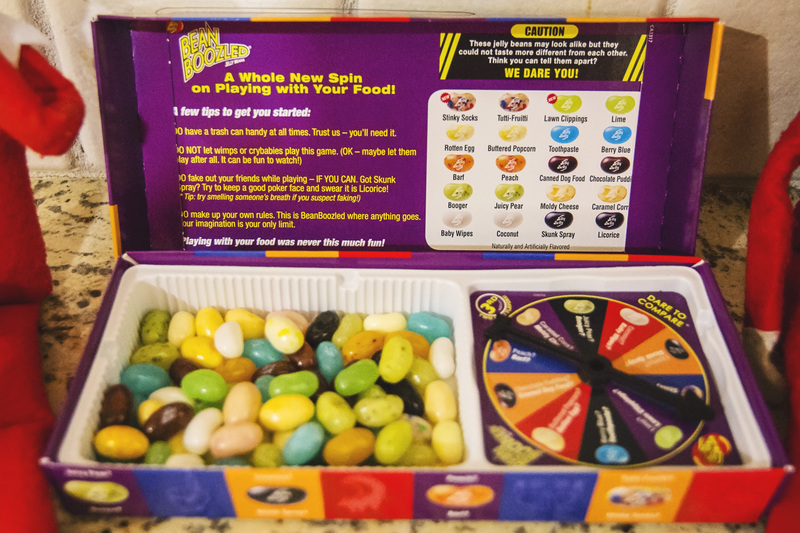 See, the evil overlords at Jelly Belly thought it would be fun to hide awful-tasting jellybeans in the mix and make it into a disgusting (and sort of hilarious) game. So you spin the wheel and that little orange-flecked jellybean you choose might taste like peach, or it might taste like barf. Black jellybeans might be licorice (which is horrible), or they might be skunk (who knew licorice flavor could get any worse?). 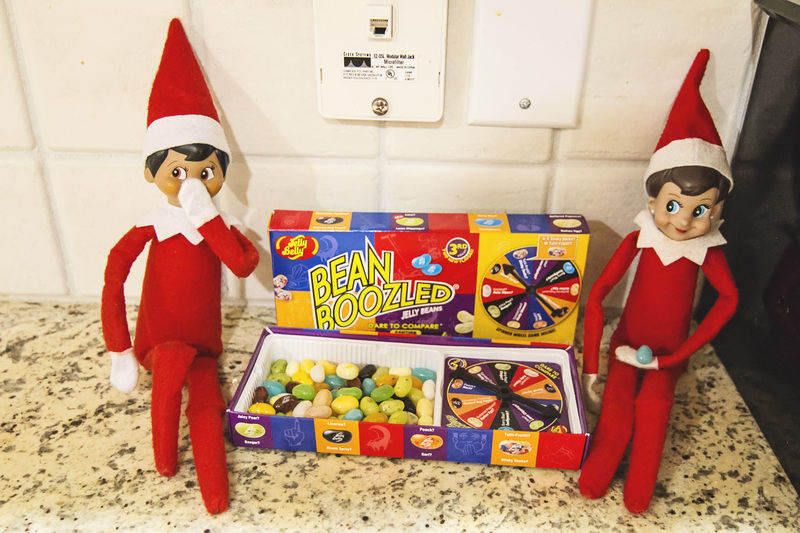 Stevie and I were first introduced to Bean Boozled at his Dad’s house in New York, when Stevie’s nephews TJ and Tyler busted out the box to play the game with Cadence. I politely declined to join in. I don’t really enjoy jellybeans to begin with, so there is sure as hell no way I’m going to pop a jellybean in my mouth that could either taste like coconut or spoiled milk. But Stevie was curious enough that after a few moments of all of us egging him on, he decided to test his luck. He choose the orange-flecked jellybean, popped it in his mouth, gave it a couple chews, and then bolted for the sink to spit it out. 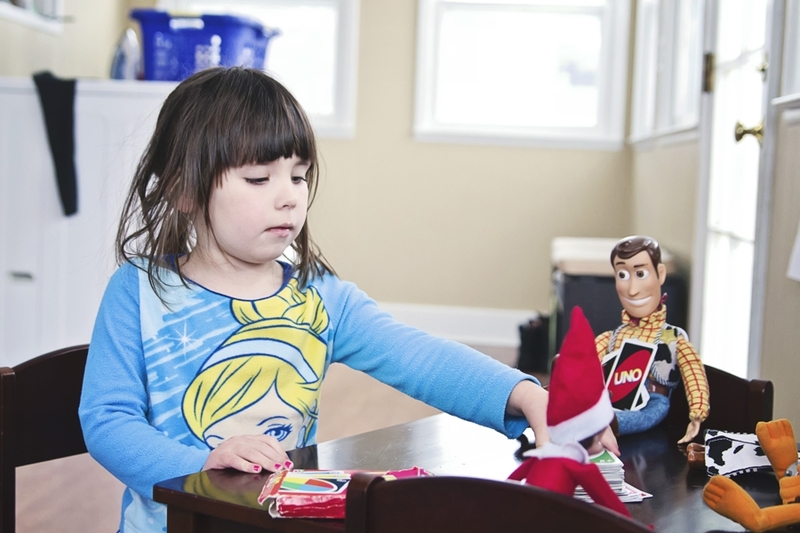 Fast forward to this year and Cadence happened to spy Bean Boozled on the shelf at Hobby Lobby. She wanted to prank some friends, so we picked up the box, and it sat in our cupboard until Halloween when we got to talking about it with some friends and decided to bust out the box and show them what it was all about. 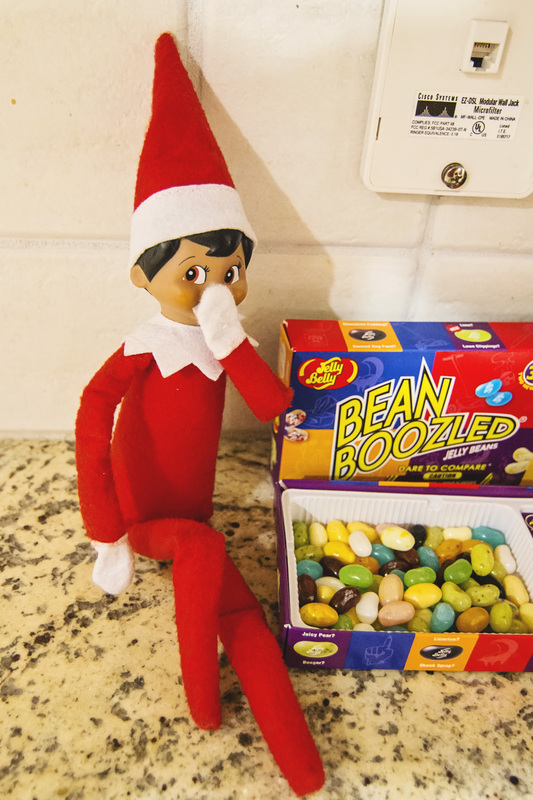 I’m not sure if our friend Jeff just has tastebuds of steel or the flavors mellow with time, but he ate a couple dozen of the Bean Boozled jellybeans and said they all sort of taste the same. Cadence was excited this morning when she got up and saw that Cosette and Leo decided to play. Cosette is either going to get a taste of blueberry or toothpaste (which Cadence says is a good choice because both options taste pretty good). Leo looks a little ill, like he may have gotten a bite of canned dog food or moldy cheese. Henry saw the elves had candy and immediately reached to grab a bite, but I managed to distract him with a bowl of oatmeal and a banana muffin. I mean, the kid has already barfed on the carpet once this week, I don’t need a repeat performance because he happens to choose a jellybean that tastes like rotten egg. He’ll thank me one day. And so will you. Beware the Bean Boozled invitations people. Anytime my hubby leads into a conversation with “Okay, you’re gonna think I’m a total lunatic” I know I’m in for something good because, odds are, I’m gonna be game (and I’m probably going to think it’s just as crazy/funny/awesome as my hubby does because, well, we both have a very similar and very warped sense of humor). The game is called Dave Thomas, the Founder of Wendy’s. Stevie found out about it listening to Episode 20 of the What Say You? podcast with Brian Quinn (Q) and Sal Vulcano, whom you may recognize from the hilarious TV show Impractical Jokers (and if you haven’t watched it yet, do so immediately). Bam! You get a point. 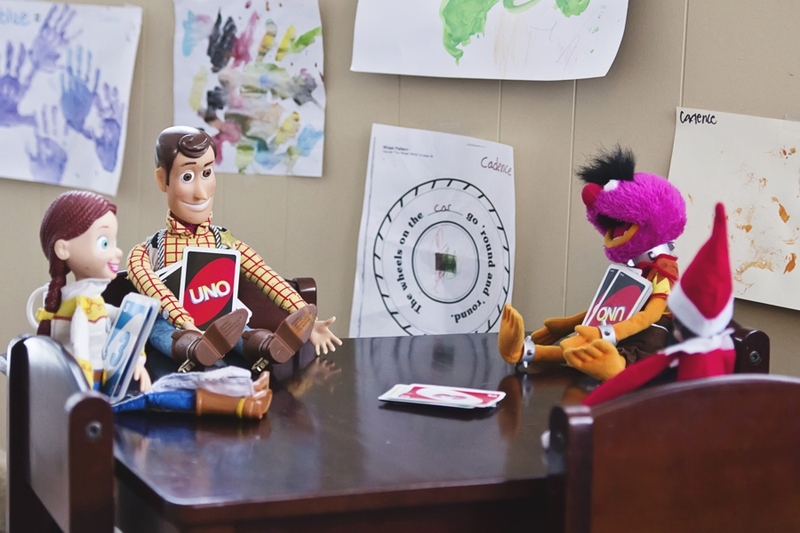 The game is going on 24 hours a day, 7 days a week, 365 days a year. January 1, the slate is wiped clean and the games starts over and you play for sheer joy and that gotcha moment where you are victorious and your opponents are kicking themselves and vowing revenge. Six months might pass, but Stevie could turn to me randomly while we’re cooking dinner and say, “Oh, I almost forgot to tell you who I saw today…” If I say, “Who?” He will suddenly yell, “Dave Thomas, the Founder of Wendy’s!” and then proceed to dance around the kitchen and rile the kids up into a tizzy. But, sometimes I just might be on my game, and instead of falling into his carefully laid trap, I can fire back with a “Dave Thomas, the Founder of Wendy’s! Booyah!”, and then I get a point. It’s simple and stupid and so freakin’ satisfying. And now my night is complete. Just recently (within the last year or so) Cadence has gotten interested in board games. 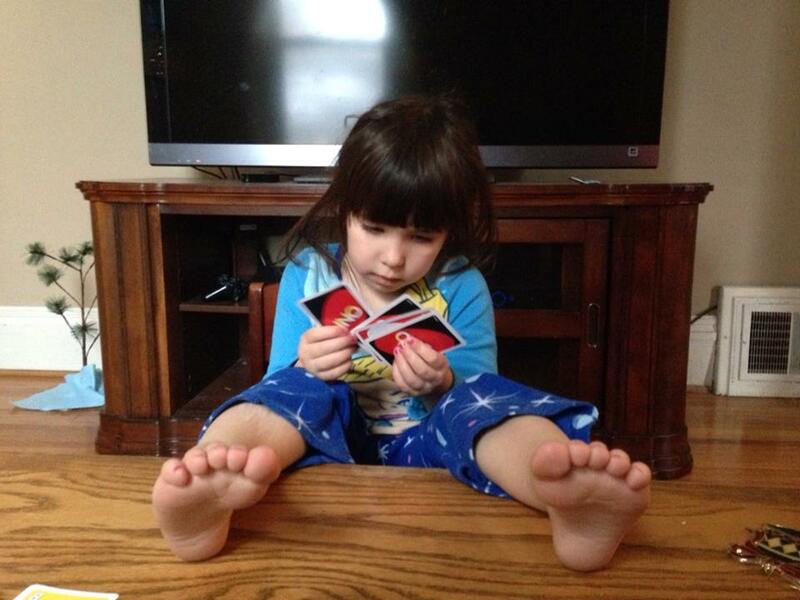 She’s been really into cards for awhile now. 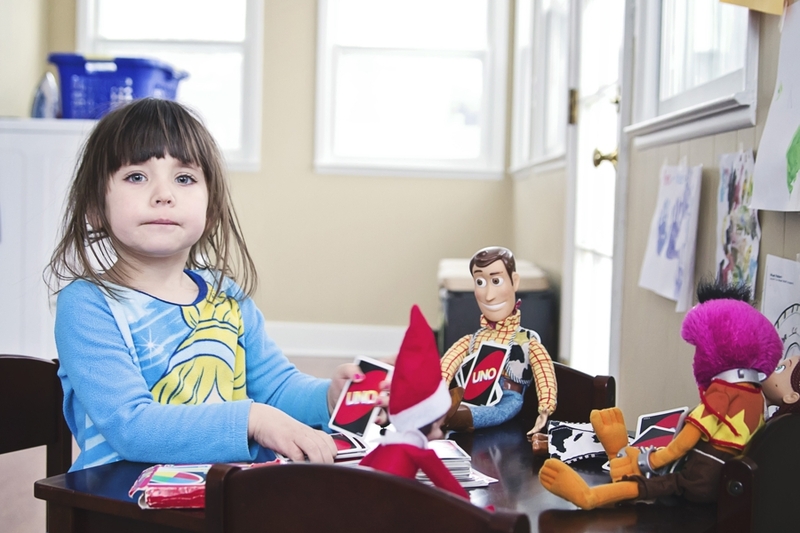 We’ve been playing Uno with her since she was 3, and this year she has gotten really good at War, Old Maid, and Crazy 8’s. 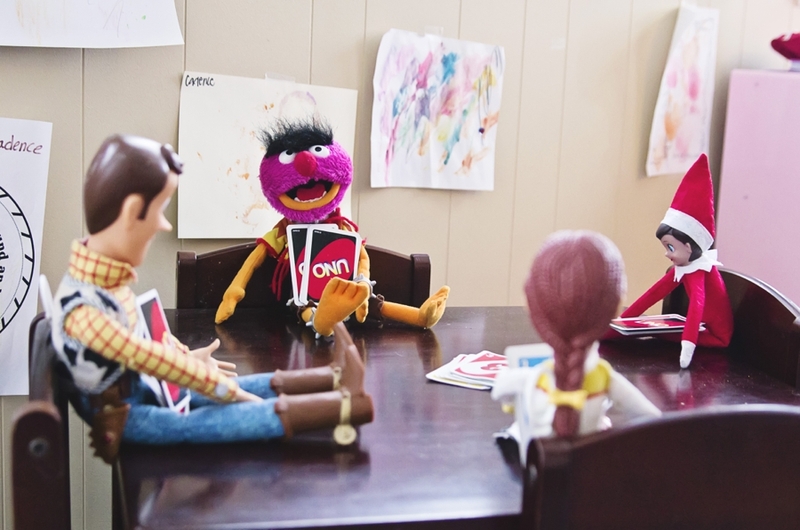 And she’s freakishly good at Go Fish. Sometimes we wonder if she’s figured out a way to cheat. 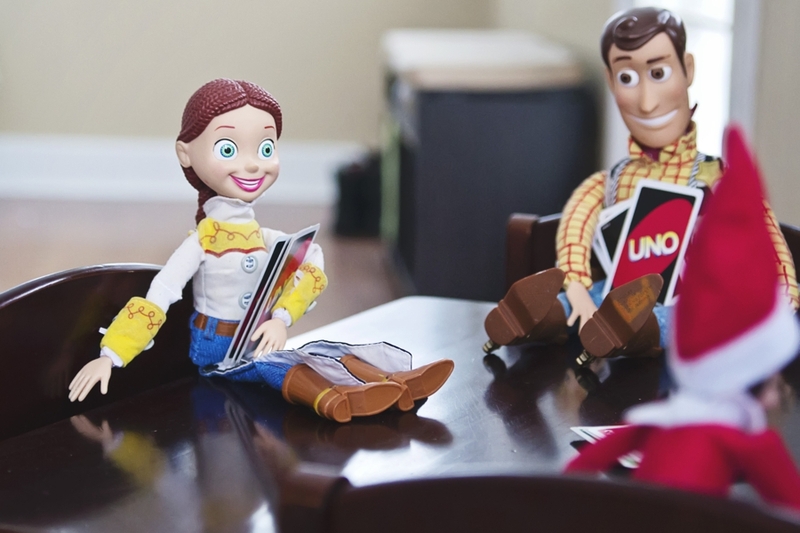 But as far as board games, she hasn’t really been all that interested until more recently. Maybe it’s finally that she’s old enough to really understand all the rules and formulate a strategy to emerge the victor. See, here in the Romano house, we don’t believe in letting our kids win. My friend Kara wrote a great article for Good Housekeeping recently that pretty much sums up our views the that subject, and you can read it HERE. 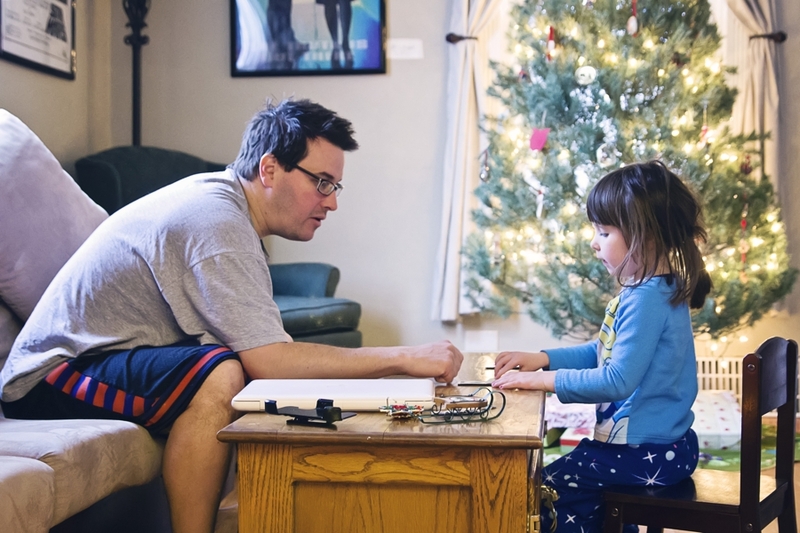 Sure, there are times when we will pause a game to explain a strategy to Cadence or to advise her to look closely before she makes a move, but mostly, we believe in letting her figure it out for herself. 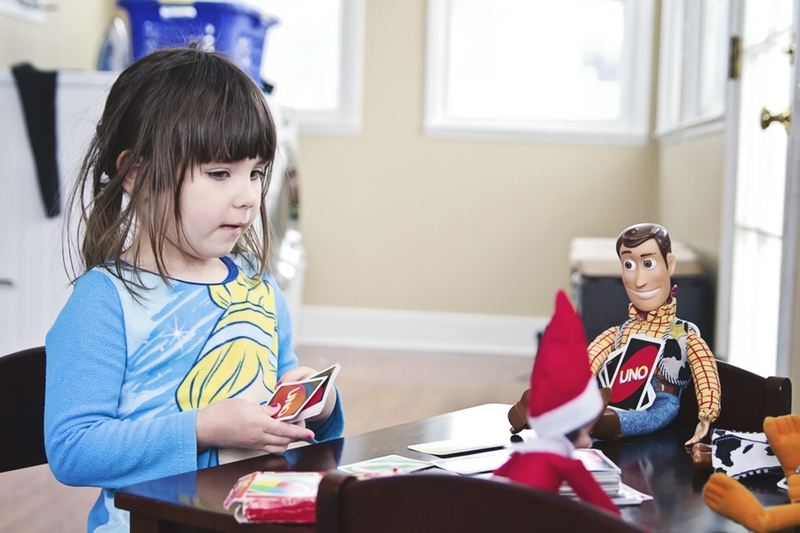 After all, these games we’re playing and the decisions she is making today are laying the foundation for the way she is going to tackle much bigger problems later on, and we would be failing her if we weren’t teaching her that failure is a part of life. 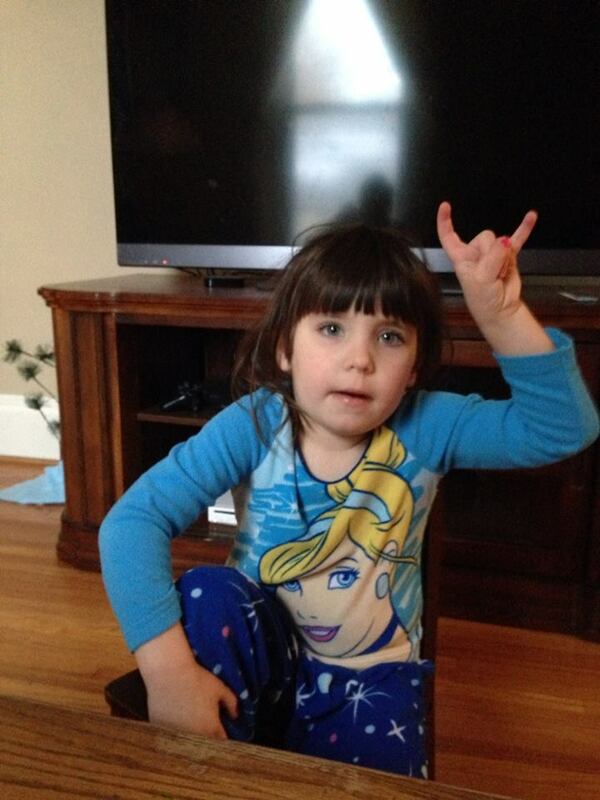 It has been awesome seeing Cadence grow through the process. Instead of crying or quitting when she loses, she takes time to think about why she didn’t win and immediately asks to play again. She’s incredibly resilient, and these days, she’s even winning more often than she loses. Her current favorites are the aforementioned card games (hell, maybe we should start teaching her a little Poker and Blackjack now), Connect 4, Zynga (which is sort of like a cutthroat Bingo), and a game called Bugs in the Kitchen where you have to strategically lead a skittering little Hexbug through a maze and into your trap to win the game. We bought her the Minion Operation game last Christmas, thinking she might get a kick out of it, but the first loud buzz freaked her out and it has been collecting dust ever since. Cosette and Leo noticed it sitting on the shelf and figured they might put it to good use. And wouldn’t you know it, Cadence suddenly seems very interested in learning to play.